Where did the year go? As year-end approaches, it’s a good time to follow a simple checklist to help your clients finalize their year-end planning. With that in mind, I’ve compiled 11 year-end planning tips to help your clients begin the new year with a fresh look at their financial plan. Review withholdings. Now is a good time for your clients to revise withholdings for the coming year by increasing or decreasing personal exemptions. For clients who are due to receive a large refund, they are technically providing an interest-free loan to the government that could be better invested elsewhere. On the other hand, by withholding too little, your clients could face a tax penalty that will reduce their overall investment return. Status changes. Has your client recently moved, bought or sold a house, changed marital status, or had a change in the number of dependents? These factors can affect filing status and offer opportunities for you to conduct follow-up reviews (e.g., life insurance, beneficiary designations, or education planning). With a solid understanding of your clients’ income sources, you can help plan for their future tax and retirement income planning needs. Be sure to review any wages, pensions, self-employment earnings, interest and dividends, alimony, and capital gains, as well as partnership, real estate, or other business income. Further, forecasting any expected changes in income can help you implement appropriate tax-minimization strategies (e.g., charitable giving). You'll want to evaluate this year's and future years’ expected income and potential tax consequences. Your clients may benefit from accelerating income or accelerating deductions into this year. Sell capital gain property that is anticipated to be sold next year. Pay medical expenses in December rather than January—if doing so will position your client to qualify for the medical expenses deduction. Pay real estate, state, and local taxes before year-end. Make next year’s charitable contributions this year. Take deductions and credits that are available only for this year. Charitable giving. The holiday season provides an opportune time for your clients to examine their charitable planning goals. Although many clients make outright gifts, a donor-advised fund is a good alternative for those who wish to make a larger charitable gift, wish to retain future grant-making control, and can benefit from a larger charitable deduction in one tax year. Noncharitable giving. Although many clients turn to charitable giving techniques, making gifts to family and friends could also have great long-term tax benefits. Annual exclusion gifts are not subject to gift taxes. Your clients may give up to $14,000 per person ($28,000 as a couple) to each person each year. Not only can they watch their family enjoy their gifts, but your clients may benefit from a reduction in future estate and gift taxes. As year-end approaches, your clients may wish to accelerate contributions to 529 plans. They may contribute up to five years of annual exclusion gifts to a 529 plan for children or grandchildren. Many states also provide a deduction for contributions to a state-sponsored 529 plan. Even more important, withdrawals from a 529 plan for qualified educational expenses are tax-free at the federal level, and some states also offer tax breaks to their residents. Educational tax credits and deductions are based on expenses accumulated over the tax year, not the academic year. Paying a tuition or loan bill early may give your clients more opportunity for tax savings. Your clients may be eligible to make tax-deductible contributions to an IRA, or they can contribute after-tax dollars to a Roth IRA (qualified distributions will be tax-free). If they are contributing to an employer plan, be sure to review their contribution amount and determine if they can maximize their pretax contribution. Remember, clients 50 and older can take advantage of catch-up contributions. A good inventory of digital assets and passwords should be kept. This should include financial accounts but also digital accounts, such as blogs, e-mail, social media, gaming, music, photo, and video, as well as “digital wallets” (loadable prepaid accounts). Of course, this information should be stored in a safe location. Your clients may even consider using a third-party vendor to help store and provide secure access to account information and passwords. As families get together around the holidays, it’s a good time to review their estate planning and talk to their children and other key family members about future plans. Encourage your clients to have open communications with their family members regarding their goals and desires. If documents are executed, remind key family members of where they are located and, if appropriate, provide fiduciaries with a copy. If your clients have not completed a recent review of their beneficiary designations and how their assets are owned, they may wish to check this off their year-end list. The end of the year presents an opportunity to review property and liability insurance. To determine if additional schedule coverage is necessary, your clients should inform their agents of any valuables, including when they were purchased, that are in excess of general policy limits. You might also want to discuss the addition of an umbrella policy, which provides an additional layer of protection. If your client is facing any age-related milestones, year-end planning can help ensure that he or she is on track with enrollment or election periods. For example, a client who is turning 65 will need to evaluate Medicare coverage, and age 62 begins a time period for evaluating social security benefits elections. If your client holds stock options, consider strategizing for this year’s and future years’ income. Consider the timing of a nonqualified stock option exercise, for example. It may make sense to avoid accelerating income into the current tax year, or deferring income to future years may make sense given the thresholds for higher tax rates. Also, don’t forget about the alternative minimum tax (AMT) when deciding to elect to exercise incentive stock options (ISOs). 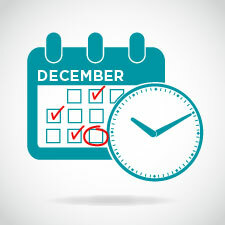 If your client is considering exercising ISOs before year-end, have his or her tax advisor prepare an AMT projection to see whether a tax benefit may arise from waiting until January of the following year. I hope these tips will help your clients put their best (financial) foot forward in 2016. Happy New Year! What issues do you address with your clients at the end of the year? How do you keep track of age-related milestones for your clients? Please share your thoughts with us below.